In the original version of DER VAMPYR, Lord Ruthven, the blood-sucker in question, has not been sucking his fair share of blood. The other vampires in his coven gather at the witches’ dance to charge him with taking three virgins by the end of the third day, or he will perish as a mortal. Tragedy ensues in the local village until the vampire is vanquished. Playwright/librettist John J King, whose IRNE-nominated parody FROM DENMARK WITH LOVE ran last summer at the Boston Playwrights’ Theatre and the Outside the Box Festival, has created an entirely new libretto for this production. 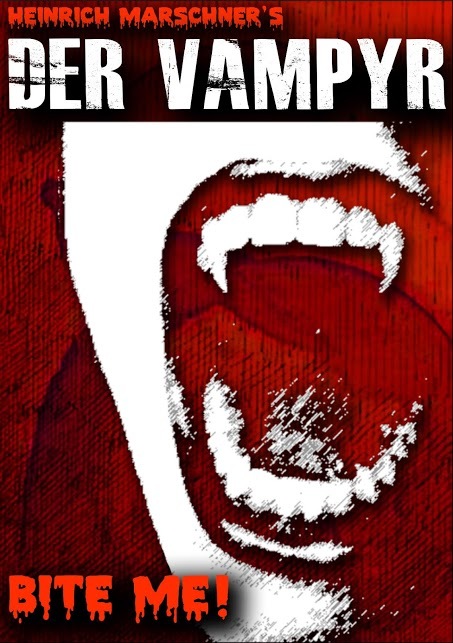 This adaptation restructures the story, tightening the plot by consolidating several characters, and broadens the scope of the story to include contemporary pop-culture vampire references. A small instrumental ensemble will be playing orchestrator Moshe Shulman’s new six-instrument arrangement of the score. Running time will be approximately two and a half hours with one intermission. Hailed by The Boston Globe as “an idealistic company that takes on…challenging, significant repertoire,” OperaHub is committed to bringing innovative, accessible, and fresh interpretations of opera in an intimate setting to the greater Boston community. Since June 2007, OperaHub has created eighteen productions, featuring music ranging from traditional to contemporary in such eclectic formats as fashion show and cabaret. For more information, visit www.operahub.org. This entry was posted in Musicals and Opera and tagged 2007, 2014, Boston Conservatory, Boston Playwrights' Theatre, Christie Lee Gibson, DER FREISCHUTZ, DER VAMPYR, English translation, FLYING DUTCHMAN, From Denmark With Love, Heinrich Marschner, John J King, June, Lina Gonzalez, Moshe Shulman, opera, OperaHub, Outside The Box Festival, The Boston Globe by Kitty Drexel. Bookmark the permalink.